At Monday night's meeting, James Wilburn told the council: "The carrot that you're dangling is separating the community." By the time the decision came before the Spokane City Council Monday night, what seemed like a simple question — who would get the contract to run the East Central Community Center — had become an imbroglio, involving race, conflicts of interest and questions of basic fairness. The seeds of the conflict were planted in December 2012, when the city of Spokane — looking to save money — handed over control of the community center to a private nonprofit, the East Central Community Organization. But many of the center's clientele, particularly in the African-American community, quickly became frustrated with the way it was being run. With the contract up for grabs this year, ECCO faced off against a competing proposal from the Martin Luther King Jr. Family Outreach Center. Initially, the first review committee to examine the proposal recommended sticking with ECCO. 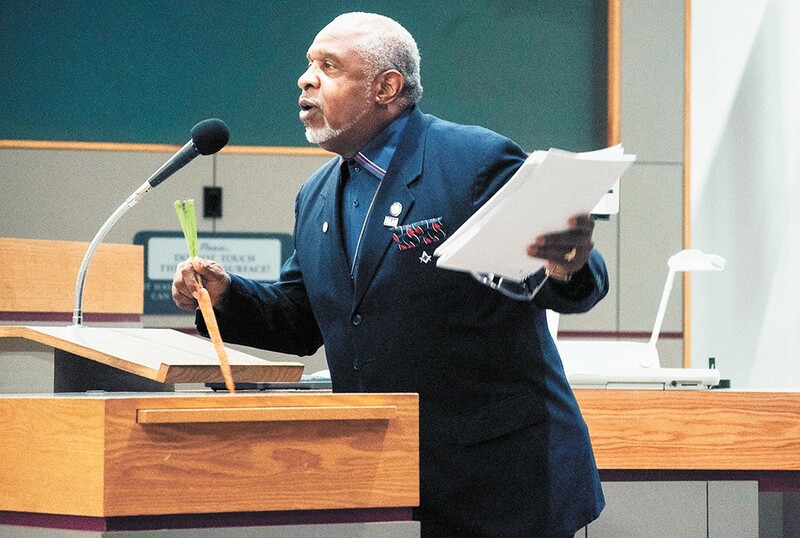 But over the summer, the MLK Center filed a letter objecting to the fact that one of the review committee's members, former Spokane NAACP president James Wilburn, had previously testified in support of ECCO. Wilburn, who said that he'd been asked by Spokane Public Schools to participate on the review committee to provide diversity, said he had not been told there was a conflict of interest. He noted that he had often supported the MLK Center as well. Nevertheless, the the city formed a new committee that recommended giving the contract to the MLK Center instead, which ticked off ECCO supporters. On Monday, Wilburn blamed the city for perpetuating division through its messy process. "The carrot that you're dangling is separating the community," Wilburn said at the end of his speech, holding up a large carrot at the podium. Phil Tyler, another former NAACP president, argued that the choice came down to the better proposal from the MLK Center, and didn't have anything to do with skin color. "It is a black-and-white issue," Tyler said. "But it's about the black ink on the white paper of the [requests for proposal] that were returned to you."